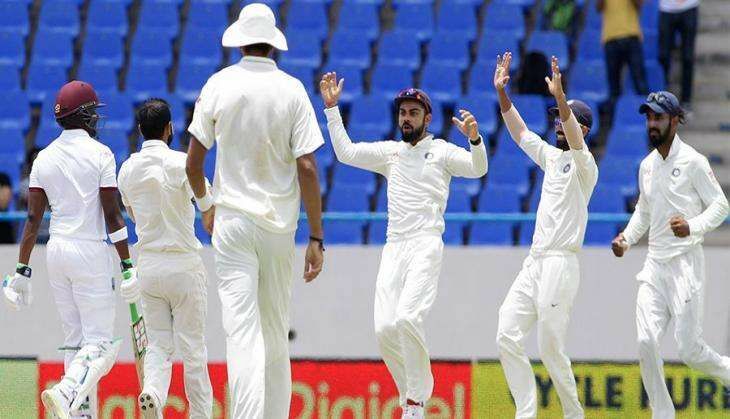 After overnight thunderstorms and incessant rain washed out the third day's play without a ball being bowled, Virat Kohli-led Indian team will be looking to rip through the batting line-up of West Indies when they take the field on Day 4 of the third Test on 12 August. At the Darren Sammy Stadium, the two teams hadn't arrived at the ground even as the clock ticked past the lunch mark at noon. Thanks to the stormy weather, the whole outfield was rendered completely soggy even as the lone Super Sopper was hard at work. Numerous muddy patches all along the boundary ropes deemed the field unfit for any play while rain stopped for just past 10 am local time. However, it picked up once again as the umpires inspected the conditions. Later, Indian coach Anil Kumble and the support staff arrived to assess the situation. The West Indies team also turned out, and afterwards the second inspection was held at 2 pm local time (11.30 pm IST). Given the rain hadn't stopped and the field was in a poor state, day three was deemed a total washout. If the weather relents tomorrow, play will begin half an hour early at 9.30 am local time (7 pm IST) with 98 overs to be bowled. It leaves only two days for the match and a result is now looking increasingly unlikely. On day one, West Indies won the toss and elected to field. India were reduced to 130/5 at one stage, after which R Ashwin and Wriddhiman Saha rescued the innings with an unbeaten century stand. On day two, the duo completed their respective hundreds -- a fourth Test ton for Ashwin and a maiden Test century for Saha -- en route to their 213-run stand for the 6th wicket to take India to 353 runs in their first innings. Afterwards, West Indies had reached 107/1 at close of play, with Kraigg Brathwaite unbeaten on 53 runs. India lead the four-match series 1-0, after winning the first Test in Antigua by an innings and 92 runs. The second Test in Jamaica was drawn.